Okay, before I start this review there's something you need to know about me. I think JJ Abrams is going to take over the world. If you don't believe me, go see Cloverfield. Abrams is in the producer's chair on this one (but will be behind the camera for the new Star Trek film) however, all he needed to do was make sure that as an audience we were left wondering what was going on well after the film ended. And that's EXACTLY what happens. Cloverfield isn't so much a movie you see as it is a collective experience between the audience and the characters on screen. I've now seen Cloverfield 3 times, and I have to say the first two were more enjoyable than the third. This was due mostly to the fact that the audio was several notches lower than it was the first time which ruined the experience and the audience in our theater today was not engaged with the characters or the story at all. Basically the whole night goes down like this. We find ourselves witnessing Robbie Hawkins and his friend with benefits Beth McIntyre the day after they've slept together. From there we jump to the last minute preparations for Rob's going away party. Twenty minutes of set up and then BOOM explosion, running, mayhem, statue of liberty head, fight for survival, END. Cloverfield is a simple movie, but it gets the job done. It's an American masterwork for the creature feature considering Peter Jackson's mediocre King Kong and Roland Emmerich's "we don't talk about this one" version of Godzilla. Cloverfield is a movie about the people running and screaming in the streets. If they don't know it, you don't know it. There's an heir of mystery to everything which I really liked, but hey, LOST is my favorite tv show so it's to be expected. Just because Cloverfield is simple, doesn't mean it's lame. The sound design on the film is incredible, it's best watched loud. As a matter of fact, it's half the experience. The acting is very well done, and the filming style totally works for the movie and is used to it's full potential (the subway scene comes to mind for that one). 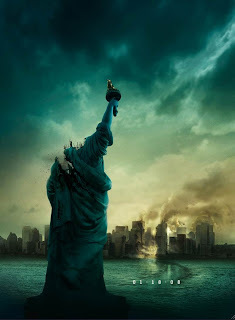 All in all, if Cloverfield set the bar for how good movies are going to be this year, I am EXCITED.